Who hasn’t come across the time stamp of history on neighborhood sidewalks? If you’re paying attention, even on a simple stroll around the block, you’ll find yourself on the trail of the past. 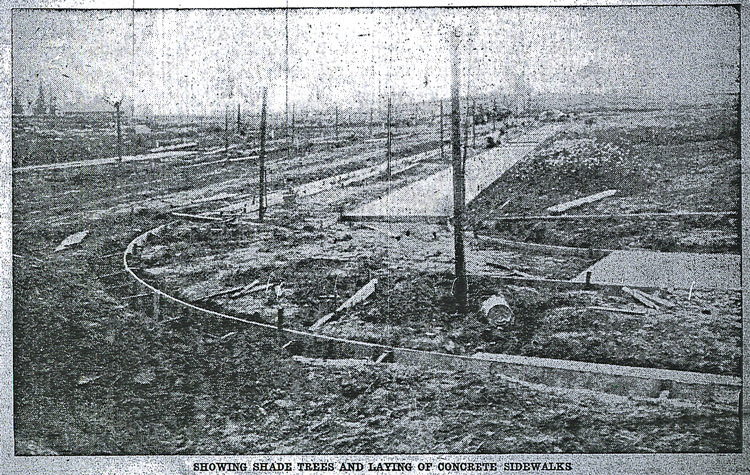 Curbs and sidewalks under construction, from The Oregonian, June 3, 1910. On most blocks–typically near the corners–you’ll find the name of the contractor who installed the sidewalks and curbs, along with the date of their construction, and even the names of the streets. Think of it as a signature, and appreciate the irony that even though the prestigious builders of the big houses are long gone, the identity of the grunt-work done by ditch diggers, form builders and concrete finishers has stood the test of time. The curbs and sidewalks on my block–block 23 of the Alameda Park Addition–were built by Warren Construction Company in the summer of 1912. Warren Construction, like other companies, had contracts with the city to excavate, frame and pour many city blocks worth of sidewalks and curbs. Look carefully and you’ll find the printed names of Hassam Construction, Krieq, Elwood Wiles and others. So, here’s some insight into two of the of the companies you’re going to bump into walking around the Alameda Park neighborhood, and some great factoids you’ll want to hang onto for scintillating dinner conversation. After you’ve paid enough attention to these names–and learned a little about the companies and when they operated–you can almost tell what era and corner of the neighborhood you’re in just by looking at the names on the sidewalks. This company once employed world-renowned chemist and Nobel Prize winner Linus Pauling as its chief asphalt inspector. Pauling, born in Portland in 1901, was a young man when he worked summers for Warren, testing the quality of its asphalt production facility. Pauling recalled, years later, how company bosses didn’t want him to go on with his studies…they wanted him to stay put on quality control. In addition to giving one of the world’s greatest chemists his start, Warren Construction also made a name for itself building and installing all of the concrete decking on the Interstate Bridge (first opened in 1917), and applying the asphalt surface once the bridge deck was complete. They also worked on the Columbia River Highway as well. If you are a walker, this man is a household name. You see him everywhere on Portland’s east side. For years, I wondered about his identity, and after doing the research, I finally have a few answers. Wiles was born in Canada in 1874, and came to Portland in 1887. After high school he worked in a variety of jobs for a local harness maker before going into the sidewalk business. From 1903 til about 1917, Wiles held the majority of all city contracts for excavating, framing and pouring curbs and sidewalks. After the big building boom of these years, Wiles dabbled in timber speculation, concrete pipe manufacturing, stocks and bonds, and insurance. In his later years, he owned an illuminated traffic sign company. He died in Portland in December 1956. Be sure to check out this photo of Wiles and biography I’ve written in The Builders section here on the site. Interested in helping create an inventory of sidewalk contractors in Alameda? A couple of us are setting out to do some documentation, and we could use a studious person with some time to spare (and a digital camera) to help. If you’re interested in joining in, drop me a note: doug@alamedahistory.org. Click here to see what’s been done in the Hawthorne neighborhood. If this topic really piques your interest, check this out. Hi Bon. Thanks for dropping by the blog and for sharing your cautionary tale from Salem. I noted in the PDOT piece on sidewalk history that the State Historic Preservation Office (SHPO) considers contractor sidewalk stamps as “interesting artifacts but are not listable resources, and can be removed.” I have noticed that most of the corner cuts installed in NE Portland recently (and there was a spate of them in the fall) have the original construction date and the reconstruction date stamped into the curb. While our friend Elwood Wiles name is no longer visible in some of these, the sense that they are old–and reprepsent many layers of footsteps–is kept alive. My house was built in 1910, as were most in this Richmond community. I’ve seen the Elwood Wiles stamp in concrete throughout this area. Since Hawthorne Blvd. is a major artery here, I’m hoping that old maps, plats, street signs etc. are available. Where do I begin my search? Thanks for your fascinating blog. Thanks, Doug. I’ll try your advice. If I find anything of interest I’ll keep you in mind.